Find your "other half" in tango! I do not mean finding someone to accompany you to tonight's milonga. If you are searching for your "other half" (or even "better half") in another person, you are likely to find another half person! 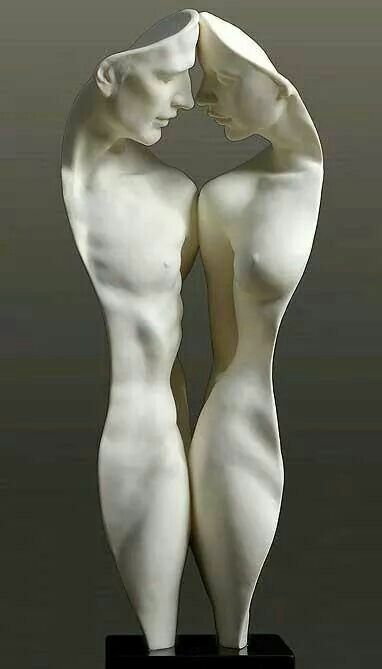 Your other half is, I believe, your introverted half finding her extroverted half, your integrated yang-self fully accepting his yin-self, your segregated male and female natures finally uniting. Biologically speaking, your other half is a balanced Autonomic Nervous System. "It's show time!" he'd tell himself, and he'd get up to address the audience with his other persona in charge, and he did a good job. "But then something interesting happened," he went on to say. "After I learned tango, I did not have to get up and be someone different. I just got up and was myself. Eventually, I was a better public speaker than before, although I was fairly balanced between being an introvert and extrovert, public speaking became much easier after I started practicing my tango in my mind and body everywhere I went." It occurred to me a day after our conversation that to some degree, I too have experienced the same sort of integration or balancing of my own personality after I started learning tango! When I ran, I practiced tango. I danced with my stiff partner (the grocery cart) while shopping. Tango was on my mind, changing me. Eventually, I was much more introverted than before. For example, I rarely talk between songs at a milonga. I am speechless. That's a miracle for an extrovert! I know that some will think that any dance one practices will create this integration of one's personality. As a salsa, swing and blues dancer, I beg to differ. Although social dance may help social skills for introverts and slow down extroverts, Argentine social tango is indeed unique among dances. That's why I prescribe close embrace Argentine tango to create this balancing phenomenon I am describing here. If not Argentine close embrace tango, then I suggest any activity that engages the calming Parasympathetic Nervous System (see graphic below). Practice yoga, learn tai chi, or experience deep meditation! 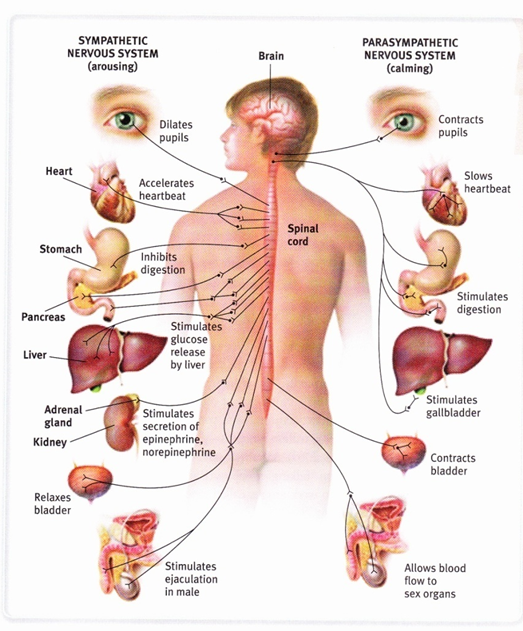 They all activate the Parasympathetic Nervous System. Performance tango, as with other open dances I love to dance, in my experience tend to produce the thrill-responsive adrenaline from the Sympathetic Nervous System too much to be called "mindfulness activities." Your calmer "better half" is on the right side. In my experience, teachers I have had who taught activities that engender mindfulness, sometimes do not practice it outside of tai chi, yoga, meditation or tango. Mindfulness practice, the 24/7 practica is what makes tango powerful in ones life. Live tango or any mindfulness discipline outside of the discipline itself. Dance tango or mindful walking while buying groceries. Find your balance while in an elevator. Secretly embody the ubiquitous music around you that seemingly merits little or no attention from those around you. 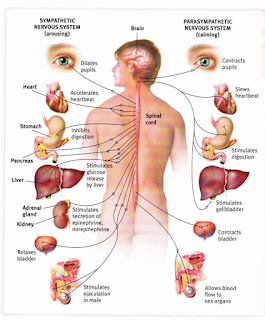 If for no other reason than your health, get to know and visit your Parasympathetic Nervous System, a part of the Autonomic Nervous System (ANS). The ANS's two branches help you breathe without thinking, your heart to beat without thinking, and yes, to dance without thinking, as I recommended in Autonomic Dancing. When our cerebral cortex consciously joins our ANS, consciously slowing our breathing, consciously paying attention the tempo of our heart beat, mindfully sensing our environment through our senses (touch, taste, hearing, smell, and balance), we find much more than just our "other half"--we find our "better half." Let me suggest again not to look for one's other half or better half in another person. Find this wholeness, these moments of Heaven on Earth, enlightenment, meditative flow and tangasmic Nirvana through discovering what lies within. Enjoy your self's Oneness on a spiritual level and on a biological level, find this balance within the internal dance of a balanced Autonomic Nervous System. Meet you in Heaven? Bring your other half. Inspiration for this post comes from a conversation with my friend, Eric Gebhart. Visit his tango blog at http://tangobreath.com/. Photo credit of sculpted couple.